Our core values explain how we pursue our mission statement, and is a reflection of what our company finds important. First and foremost, we are passionate athletes who happen to enjoy helping people live healthy and active lives. Everything we do is influenced by our mission statement and core values. Read about our values and the programs we've developed to support those values. We invest in our people. We seek and develop the best employees in the industry. We are constantly educating, training, and challenging our staff to improve themselves. We invest in our customers. We commit time and resources to show our customers that we are as dedicated to and excited about them reaching their goals as they are. We invest in our community. We commit 1% of our annual gross revenue back to the community that sustains us. We believe that innovation is necessary for survival- and pursue thoughtful innovation in all things we do. We do not sit back and accept the status quo- but instead seek innovative products and develop innovative services and systems within our business to help our clients reach their goals. We believe being honest keeps life and business simple, and will always be honest regardless of the consequences. We seek partners in business that produce honest products, and market them honestly. We believe in operating to make a humble and honest profit, and reinvest a portion of that profit back into our people, customers, and community. We take pride in finding and selling quality products. We don't seek the most expensive product, but the highest quality product that best fits our clients' needs and desires. We constantly challenge ourselves to consistently produce the highest quality result from our services. We create and innovate systems within our business that produce consistent, high quality results. At Tri Town we pride ourselves on not only the quality of bikes and equipment we sell, but also the quality of service we provide to keep these amazing machines and gear on the road. 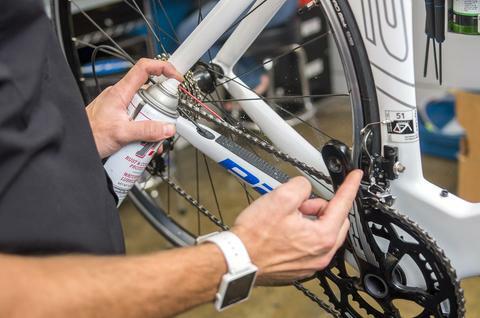 On every bike we sell we include a Free 1 Year Service Contract with the purchase of your bike that covers all adjustments, repairs, and tune ups needed within that first year of use. Many of our customers love the peace of mind and convenience of their service period, and now you can extend that service period by 2 additional years for $300 (slightly more than one Iron Overhaul tune up). the cost of parts of any kind. repairs for parts damaged in an accident or from misuse. installation of parts purchased else ware.